Break out your wands. Nickelodeon has released a new preview for the return of The Fairly Oddparents. New episodes premiere on January 15th. Created in 1998, The Fairly Oddparents has been airing on Nickelodeon since 2001. 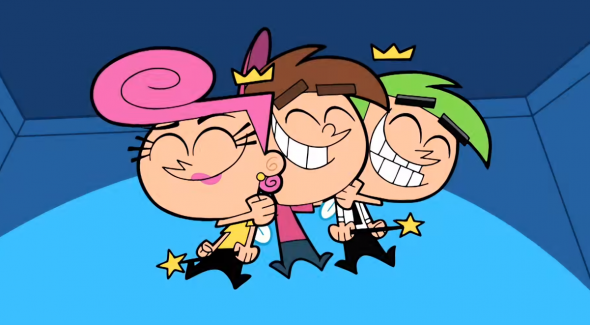 It follows the adventures of Timmy Turner and his two assigned fairy godparents, Cosmo and Wanda. The series is Nickelodeon’s second longest-running cartoon on the network, right behind SpongeBob SquarePants. The new episodes spark a significant change for the series. All this time, it’s just been the trio of Timmy, Cosmo, and Wanda. Now, Timmy will have to share his godparents with another kid, Chloe, for the first time. What do you think? Do you watch The Fairly Oddparents? What do you think of the new change? More about: Nickelodeon TV shows: canceled or renewed, The Fairly OddParents, The Fairly OddParents: canceled or renewed? Timmy sounds weird. Did he always sound that much like a girl? And why didn’t we hear Wanda? Well Timmy is feminene because he’s voiced by ACTRESS Tara strong who’s also done animated voices like shows such as, Teen Titans, Powerpuff Girls, Ben 10, Rugrats, Chowder, Foster’s home, All grown up!, the proud family and numerous of other cartoons. They probably just showed mostly the first few episodes of the season, which is what trailers from TV shows usually do, and Wanda just so happened to not be involved in those “major scenes”.